The whole discipline of optical measurement techniques can be roughly subdivided into the two areas of photometry and radiometry. Whereas the central problem of photometry is the determination of optical quantities closely related to the sensitivity of the human eye (see � II.6. ), radiometry deals with the measurement of energy per time ( = power, given in watts) emitted by light sources or impinging on a particular surface. Thus, the units of all radiometric quantities are based on watts (W). According to CIE regulations, symbols for radiometric quantities are denoted with the subscript �e� for �energy�. Similarly, radiometric quantities given as a function of wavelength are labeled with the prefix �spectral� and the subscript �λ� (for example spectral radiant power Φλ). Remark: The definitions of radiometric quantities cannot be understood without a basic comprehension of differential quantities. For an intuitive understanding of these quantities, which is the main purpose of this paragraph, the differential quantities dλ, dA and dΩ can be regarded as tiny intervals or elements ∆λ, ∆A and ∆Ω of the respective quantity. As a consequence of the fact that these intervals or elements are very small, radiometric quantities can be considered constant over the range defined by dλ, dA and/or dΩ. Similarly, dΦe, dIe, dLe and dEe can be regarded as small portions which add up to the total value of the respective quantity. In paragraph II.5., the concept of differential quantities and integral calculus is briefly explained for spectral radiometric quantities. As the area A is proportional to r�, this fraction is independent of the actual choice of r.
If we want to calculate the solid angle determined by a cone, as shown in Fig.II.area A is the area of a spherical calotte. However, as the solid angle is not only defined for conical parts of the full visual field, area A can be any arbitrary shape on the sphere�s surface. Radiant power Φe is defined by the total power of radiation emitted by a source (lamp, light emitting diode, etc. ), transmitted through a surface or impinging upon a surface. Radiant power is measured in watts (W). The definitions of all other radiometric quantities are based on radiant power. If a light source emits uniformly in all directions, it is called an isotropic light source. Radiant power characterizes the output of a source of electromagnetic radiation only by a single number and does not contain any information on the spectral distribution or the directional distribution of the lamp output. Fig. II.7. The radiant power of Φe of a light source is given by its total emitted radiation. In general, radiant intensity depends on spatial direction. The unit of radiant intensity is W/sr. Fig. II.8. Typical directional distribution of radiant intensity for an incandescent bulb. In this relation, λ is the angle between the direction of the solid angle element dΩ and the normal of the emitting or reflecting surface element dA. whereby J is the angle between the emitting surface element dA and the direction for which Ie is calculated. The unit of radiance is W/(m2.sr). Fig. II.9 � Irradiance is defined as incident radiant power dΦe per surface area element dA. The unit of irradiance is W/m�. The integration is performed over the solid angle of 2π steradian corresponding to the directions on one side of the surface and J denotes the angle between the respective direction and the surface�s normal. The unit of radiant exitance is W/m�. In some particular cases, Me= Ee (see � II.8.a). The radiometric quantities discussed above are defined without any regard to the wavelength(s) of the quantified optical radiation. 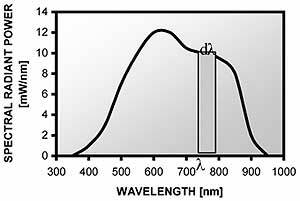 In order to quantify not only the absolute amount of these quantities but also the contribution of light from different wavelengths, the respective spectral quantities are defined. This equation can be visualised geometrically (see Fig. II.10.). As dλ is infinitesimally small, spectral radiant power Φλ(λ) is approximately constant in the interval between λ and λ+dλ. Thus, the product Φλ(λ) dλ equals the area under the graph of Φλ(λ) in the interval between λ and λ+dλ. This area describes the contribution of this very wavelength interval to the total value of radiant power Φe, which is graphically represented by the total area under the graph of spectral radiant power Φλ(λ). The unit of spectral radiant power is W/nm or W/�. Fig.II.10. Relation between spectral radiant power Φλ(λ) and radiant power Φe, visualized at a hypothetical example. 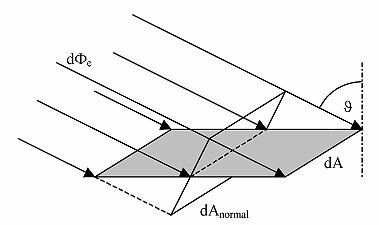 Radiant power emitted in the wavelength interval between λ and λ+dλ is given by the area of the shaded rectangle, which amounts to Φλ(λ) dλ. The total amount of radiant power Φe emitted over the whole spectrum is given by the area under the curve describing Φλ(λ), which is mathematically expressed by an integral. as the UVA range is defined from λ= 315 nm to λ = 400 nm.